I may be the Global Product Success Manager for Reward Gateway, but in a past life at RG, I spent most of my time working with different clients and communicating to their different demographics. It's so important to tap into what those differences are, and one of them is a generational difference. Millennials are a demographic in their own right. The term has been bandied around for a few years now, but their presence – and uniqueness – has finally settled as a very real, very tangible aspect of working life. But in order to communicate, work with and engage millennials effectively, we need to understand why and what makes them different. These sweeping statements don’t paint a pretty picture, do they? But rather than accuracy, what I believe we have here is well-embedded and ingrained stereotypes. Job hopping and not working hard are blamed on the millennial generation. But actually, there are two things here and what we need to realize is that job hopping does not necessarily reflect an unwillingness to work hard, this is a misconception. When it comes to job hopping, the reasons for this are down to the generations before them and the world they have created and not a distaste for hard work. Job security is not what it was. Nowadays people don't go to a job for a good salary, work for a set amount of time and then retire to a steady pension. That is not the world that we live in anymore. In addition to this new world without long term job security, millennials get paid less relatively than any other generation that's come before. Specifically, 65% less than the previous generation. What this means is that people don't focus solely on pay to get job satisfaction and they look for other things of value within the workplace. So, hopping jobs does not necessarily mean an unwillingness to work hard. Rather, it is a sign of lower wages, poor job security and a search for satisfaction. "Millennials are bad at listening." 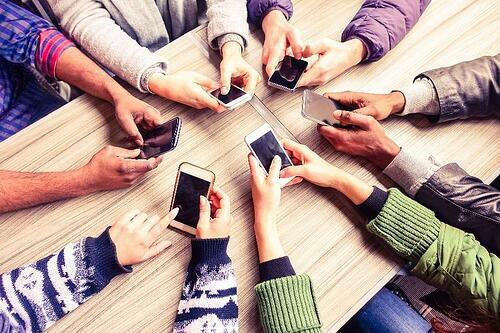 The millennial generation, thanks to growing up in a digital age, receives the most amount of information out of anybody ever! It’s not that they don’t want to listen, it’s that, with so much information fighting for their attention, they have to be selective and only absorb the necessary information. There is simply too much to cope with otherwise. 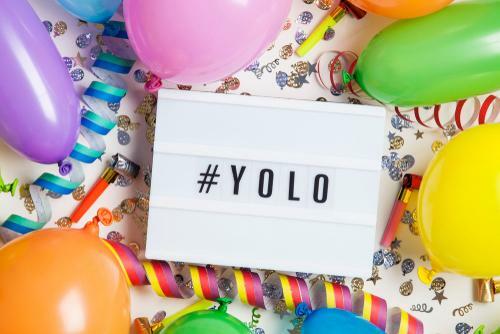 These are just some elements of what makes a millennial– the lack of job security, the information overload, and the social pressure to have a good life. This isn't something that millennials have chosen for themselves, it is a result of the world they grow up in. 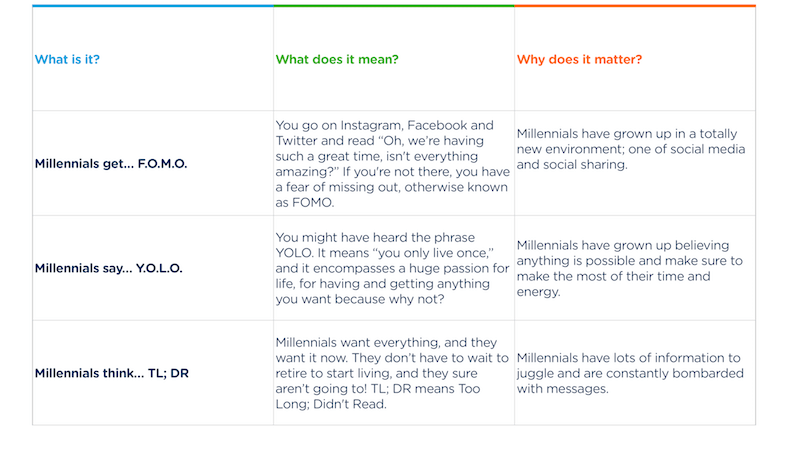 Let’s look at three specific ways that millennials are different to generations before them. So how can you communicate with them, with all of this in mind? Take the TL;DR example above. Why would they read a 30 page 401(k) booklet, when they can just go online and find out the latest stock market results, news, politics or anything at a click of a button? They wouldn’t. 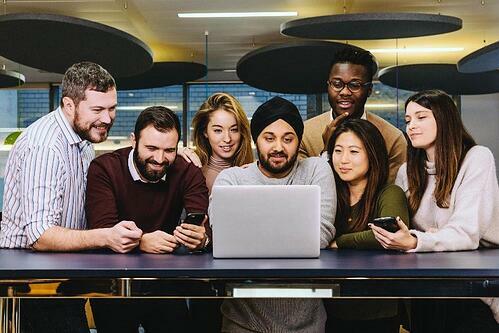 So, instead of wasting your time and trying to convince them to waste theirs, let’s break down three ways you can tailor your communications to make it more effective to the millennial workforce. There is a famous saying that goes “People will forget what you said, but not how you made them feel.” This particularly applies to communicating with millennials, who are an intrinsically emotive generation. So you can tell them about a new benefits program, or a pension program, but they will forget. Instead, find a way of communicating the information that connects with them. You can know every detail in the world about a product or service you want to communicate, but telling your millennial staff everything is unnecessary. Don’t overload them with information and scare them off. Instead, you just need to entice them. Keep it clean, use visuals and make it about people and experience. Take inspiration from brands like Apple, who are very good at this (and very successful as a result). Millennials, though they have similarities, are still each their own individual person. This means that they won’t all absorb your communications in the same way. So use varying types of channels, length, and methods. Millennials are a byproduct of the environment that they have grown up in, so when it comes to successful communication, an element of empathy is required. Millennials are different but they are a consequence of their upbringing, and it’s on you to tailor your workplace communications accordingly.